MM had the idea to make a tall castle on the block platform. As she began to build, she was joined by three friends, J, MC, and C, who asked what MM was doing. “I’m making a tall castle,” MM told them. The friends watched MM line blocks along the perimeter of the block platform. 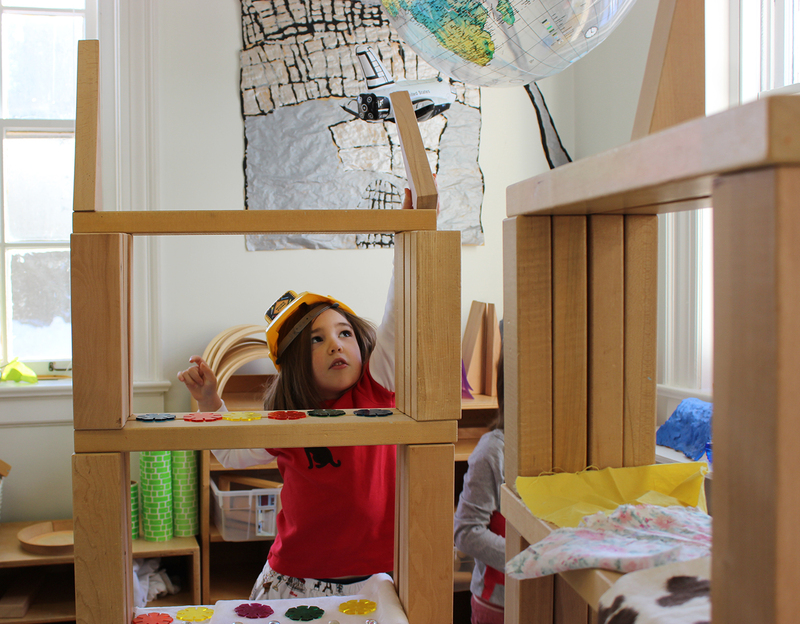 When one pointed out that MM was not, in fact, building tall, MM acknowledged the contradiction, but she continued to add blocks to the one-layer surround she was building. C stepped in and offered to show MM how a tall castle might be built. 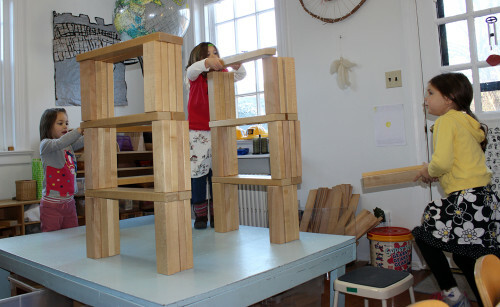 MM welcomed the tip, and the children began to build. When the structure was at the top of the children’s reach, they called it a castle. Though their image of their castle was “tall,” it seems that height was the only dimension they were considering. 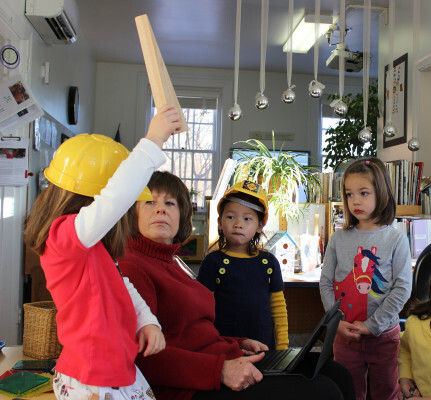 When I asked, “How many walls does your castle have?” the children’s mental image of the castle shifted, and the “castle” became “the wall of the castle.” They returned to work, and they built two more walls, though not where one might imagine they would be. MM builds a wall of the castle. I found it interesting that the children built discrete walls with no intention of connecting them. Perhaps they did not set aside their image of “castle” as having one wall after all. J calls a meeting to discuss turrets. The other children agreed to install the turrets before continuing to decorate. And then they went back to decorating. 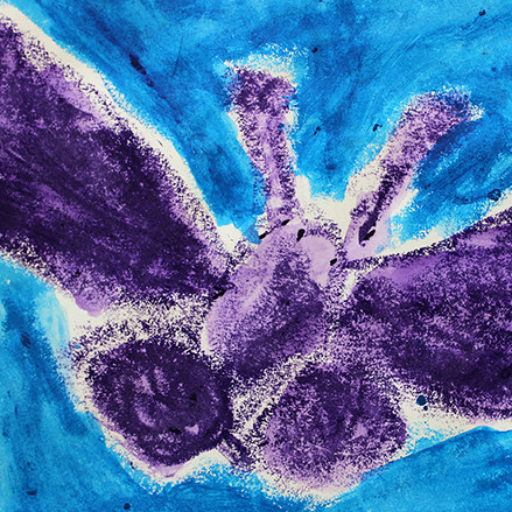 When children revisit for one purpose, they often find a reason to keep revising. After going back to building, J and C decided to create an entrance for the castle with a portcullis and a drawbridge. They began to build both elements in the same space, as portcullises and drawbridges would be. The two elements kept knocking each other down. After many attempts, the girls seemed stuck. We try not to intervene in the children’s problem solving, but sometimes, when work is at an impasse, just a little support in the form of information or technique or even just emotional support can free the process so that it can continue. This seemed like such a time. I offered to help the girls do a little research on the iPad. (We ask. Then, if the children ignore us or decline the offer, we know that our timing is off or we have misinterpreted the impasse). When the girls saw how portcullises and drawbridges coexist, they were able to reorganize the task. C set out to make a portcullis with cylinders and string. J created a rudimentary pulley with her plastic square and string, which intrigued the other children both in and outside of the building group. The pulley reappeared as a useful machine in later structures. 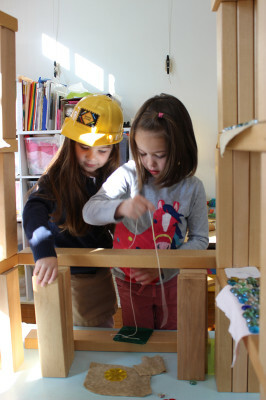 Children worked over several days to understand how pulling down on the string makes the drawbridge go up. *We are a school for girls. I know that there are some differences in the way girls tend to approach building and differences in the ways we have to support them. 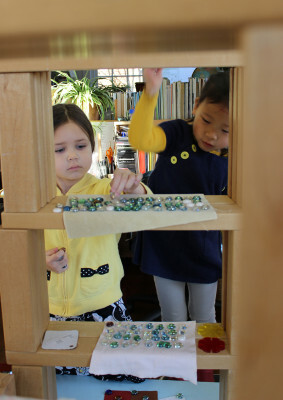 For example, most often when they come to us at the beginning of the year, the girls tend to build low enclosures, for the purpose of dramatic play. 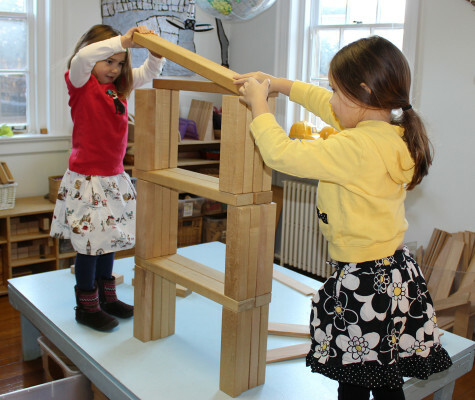 Years ago, a teacher at our brother school observed that the boys tend to build tall for the purpose of knocking down (or maybe just for the sake of building), but until they are encouraged to do so, they rarely engage in dramatic play with their structures. Is this your experience? 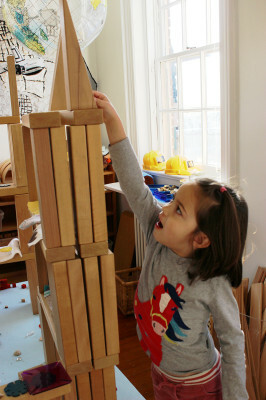 *Once the girls know of the possibilities in building tall, they set their own tall challenges. And then, they decorate. Do four- and five-year old boys do this, too, when they build? Is decorating an important part of the process for them? 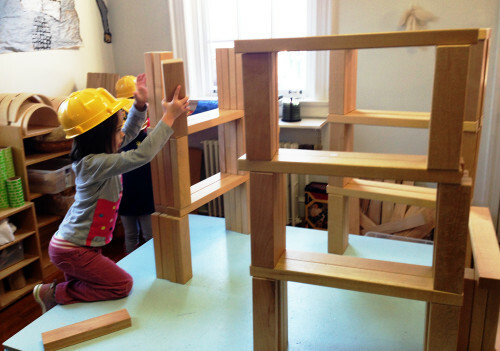 How does it tend to go when girls and boys build together? *What is the purpose of decoration? It seems intensely satisfying for the children. Sometimes it appears less about aesthetics than about covering all surfaces. We do notice that as the year progresses, decorating block structures becomes more and more ordered, looking more like dumping at the beginning of the year and more like design toward the end. 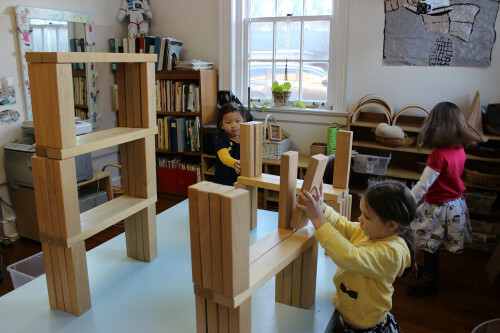 *What kinds of problem solving with blocks have you observed? How do children teach and support each other? What protocols have you developed to support learning through building (examples from this post: build-and-then-decorate policy or children calling meetings for negotiation when necessary)?